John Wall led the way for the Washington Wizards who renewed their rivalry with the hated Cleveland Cavaliers Saturday evening. John had arguably his best game of the season with a final stat line of 28 points, 6 rebounds, 7 assists, and 4 steals. Kevin Seraphin and quasi starter Bradley Beal provided sparks off of the bench with with 12 points each. The Wizards started the game hot with Nene and Gortat hitting their first 3 shots combined from the field. Initially, it looked like the Wizards wouldn’t have an answer for Kyrie Irving who was slashing and getting to the hole at will. Kyrie also had several nice assists including an alley-oop to Lebron in transition. The outcome of the game was decided on bench production. The Wizards bench outscored the Cavs bench 40-9. The Cavs bench didn’t score a bucket until late in the 3rd quarter when Dion Waiters hit a jump shot. The Wizards bench ballooned the lead to 13 at halftime as the Wizards shot 52% from the field in the half and dominated the points in the paint 36-14. The Wizards came out hot in the third quarter thanks to John Wall who had his best all around quarter of the season. John ended the quarter with 17 points on a combination of drives past his man and confident looking jumpshots from the elbows. There was a stretch in the quarter where John scored 3 jumpers on 3 consecutive possessions. It looked like things might fall apart for the Wizards who had some sloppy turnovers in the 3rd quarter and allowed the Cavs to hang around. Additionally, there was a 50/50 call where Nene was going up for a dunk and extended his off hand and was called for an offensive foul. Randy Wittman got hit with a technical foul as a result. The 4th quarter was ugly for both sides. The Cavs outscored the Wizards 13-11 but did not score a field goal in the last 9 minutes of the game. An uneasy site for the Cavs occurred when Kyrie Irving shot a 3 pointer, Kevin Seraphin out rebounded Lebron and then he casually jogged back on defense. The Cavs were still able to make a run and keep things in striking range. As predicted, Paul Pierce and Lebron had a few words for each other while getting set up for a jump ball. LeBron couldn’t decide where he wanted to stand so Paul gave him a little push to hurry things up. 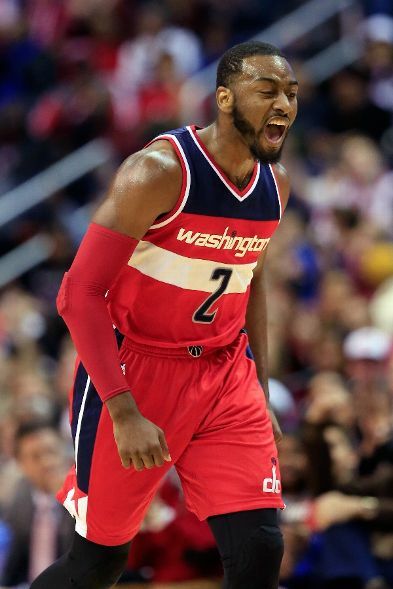 The Win moves the Wiz to 8-3 and give them that “signature” win they’ve been lacking this season. The Cavs fall to 5-6.